I TAKE A LOT of reading recommendations from people I follow so I am used to sharing books, book reviews and online social tips from friends. 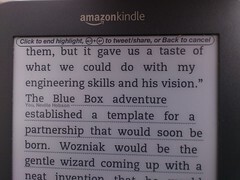 But shared annotations on Kindle take me to a higher level. I started reading Steve Jobs by Walter Isaacson shortly after its arrival via my wireless connection to the Amazon Store. I intend to use the book in conjunction with several third level modules I teach at LIT-Clonmel so that means I will read the whole book. It's easier to accelerate my reading while holding the e-ink version of the biography because I can see dozens of comments from those who have read and shared their annotations. Yesterday, I noticed Neville Hobson was chapters ahead of my pace (see the photo) so I picked up my reading speed in the hope of catching him before the end of the week. I suspect that he might have already finished all 800 pages so I might sneak a peek at Neville's shared library to verify whether it shows he's read the book. However, when I do that, I might end up buying a book that's in Neville's collection. Kindle makes that so easy. RESULTS FROM IRELAND'S Presidential election dominate this week's Sunday broadsheets with the Labour Party candidate Michael D. Higgins the gracious winner. Several intriguing twists played out during the 2011 Presidential election, including the biggest loss by Fine Gael (the current party leading the government) in any national election and the huge setback faced by challenger Sean Gallagher, an entrepreneur running for national office. Gallagher was tarred with the same brush that swept the Fianna Fail party from office. I made today's video with my SonyEricsson Xperia Arc between rain showers in my back garden, highlighting interesting items related to emerging Irish entrepreneurs, an Irish company selling directly to the Chinese domestic market, the return to form by Nokia via the Windows Phone this week, and thoughts about how the delivery of news is starting to shift in Ireland. 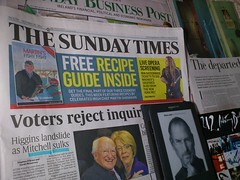 The jury remains out in whether the Irish public will pay enough to sustain traditional journalism in a tablet-oriented market. You can see this newsround by clicking on the image or by continuing below the break to my 10-minute news clip. I just noticed that YouTube permits the recording and uploading of 3D clips, something the Xperia Arc is capable of recording. I wonder what will happen if I begin offering shorter 3D newsrounds in the future, all recorded on the small mobile phone. A FEW YEARS AGO I spent a few days in London and got charged EUR 248 for using my mobile phone. Every day I was in London, the fee averaged out to more than $300 a day. This year, O2 spotted my data use after EUR 64 and cut me off. That didn't happen when I visited the States--as the O2 bill shows I failed to shut off data roaming. NOKIA TOOK BIG LEAPS towards reinventing itself as a company, starting with a burning platform metaphor in February and culminating with the successful launch of its first Windows Phone nine months later. It's a success story in the making. The new Nokia handsets are stylish and functional. They appeal to me and I will merit the attention of anyone with a two-year old Apple or Android handset. I COME FROM A generation of internet users who often prefer meeting in real life over meeting online. My expansive online profile renders me unclean in a lot of their minds. Their cautious perspective is also echoed by some of the mature students I teach, by people I nudge into new online communities and by many in very traditional corporate sectors. On the one hand, they know they should sprinkle Twitter dust on their personal brand. But on the other hand, they don't want to alarm conservative colleagues. ONE OF THE THINGS that resonated with me during the launch of the Nokia Lumia is that the phone comes from a totally enormous brand. Two brands, if you consider Microsoft. And while Microsoft is often derided as a dinosaur in tech space, I think it has hit a success with its partnership in Helsinki. The Lumia 800 handset is a first generation Windows Nokia phone. As such, it is levels above the capability of the first generation iPhone that I carried around without copy and paste. And for someone working with Sharepoint or Exchange services, the Lumia will deliver collaboration in elegant and mobile ways. NOKIA WORLD BRINGS together handsets, location-aware search results, and service providers. I listened to five clever speakers talking about what lies ahead in the world of location-based services. Ford wants to use its vehicles as platforms and through that platform allow drivers to operate safer and with elegant background syncing. I hear Leo Laporte talking about Ford Sync and I like the idea of thinking of my car as a wheeled device connected to the cloud. I HAVE SEEN THE future of Nokia's product line and I want some of it in my hands mainly because the Nokia Lumia's touch, feel and function totally relegates my iPod Touch. Some terrific hardware inside the Nokia Lumia 800 makes this phone a Hero Product for me. Products I use every day work better on the Lumia. Nokia Drive takes my maps to a new level. Mix Radio helps me escape from the overweight iTunes, Lumia 800's intelligent icons don't require me to tap and see because everything automagically pushes fresh content directly into view on the screen. This intelligent presentation makes the iOS 5 notification flow look irksome. A lot of visual purity appeared on screen at Nokia World 2011 and it would have made Jony Ive envious. Nokia has a strong legacy of functionally beautiful phones. The products Nokia announced and shipped today symbolise a new dawn for Nokia and they restore my faith in the company's understanding of how people want to connect. NOKIA UNVEILS ITS first Windows Phone shortly and enjoys a sliver of light in a market spoiled by the surprise of "one more thing". For years, Apple delivered that new thing in yearly cycles but this year's iPhone is not a game changer. 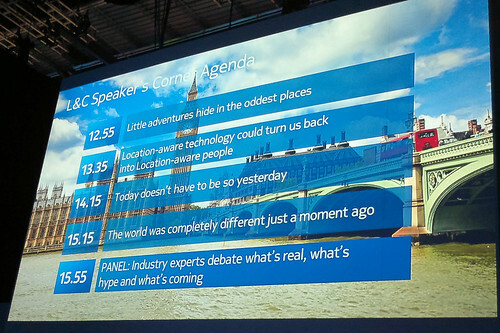 The market likes new things and from what's leaking in buzz-filled London hotels, the webcast audience will get to see some clever uses of mobile technology at Nokia World 2011. HIGH WINDS ARE BLOWING RAIN sideways in my part of Ireland as I look at Sunday newspapers predicting a Presidential election win for Sean Gallagher. Actually, I think the Sunday paper with the largest circulation offers a front page endorsement of another candidate but if you follow the odds at the bookies, Gallagher will be the next name on the Presidential Honour Roll. I've made a short video while flicking through four newspapers today, including local coverage of the closure of Kickham Barracks in Clonmel. The Irish Defence Forces are rationalising and that means centralising assets in larger cities around Ireland. 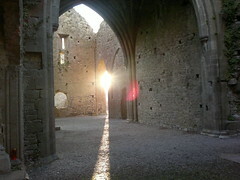 Losing Kickham Barracks will affect Clonmel in several ways explained by Michael O'Connell's Audioboo. It's a story we're following in the Public Relations module I teach at LIT-Clonmel. Other Sunday news stories form part of the video below the break.